How do some dealers over achieve while others just plod along and settle for mediocrity? I often ask myself this question as I monitor the progress of my clients. My training program provides me with the ability to monitor the scores and results of my clients, and it’s always nice to see a new client climb their way to the top of the list. Yet there are others who start off in the bottom 20% and stay there month after month. As a coach and trainer this troubles me and has led me to incorporate accountability tools into my training program. But, no matter how good the solution or product, change only happen when effort is put forth. You will not get physically fit by simply purchasing a gym membership. It takes a lot of hard work and effort to make a difference. Dealers often waste thousands of dollars to procure solution after solution with hopes of increasing automobile sales. Vendors claim their products will help you sell more vehicles, however, if not used properly the investment becomes another needless expense added to your bottom line. How many of you have the latest and greatest CRM tool, yet your sales team doesn’t use the tool as intended? How many of you spend thousands of dollars on advertising, yet your salespeople are not trained to properly handle a phone call? What about the Internet leads that generally go unattended for hours before a salesperson decides to respond? And if they do respond quickly, it’s typically just enough to satisfy the expectations of the manufacturer. Simply throwing money at a problem does not solve the problem. Do you want to be great in 2011? Well it all starts with the captain of the ship. If it’s not on your radar screen it certainly won’t be on the minds of your employees. Do you want to drive positive change in your dealership? Why not start by putting a well thought out process in place? Explain the process, provide training on the process and demand results. Then, monitor and manage the process and hold your staff accountable. Failure to execute should result in the execution of ones employment (?). Staff who have been trained but still don’t meet expectations should be replaced. There is no reason to settle for people who just want to be mediocre, including General Managers. Success in this industry is generally very well compensated. 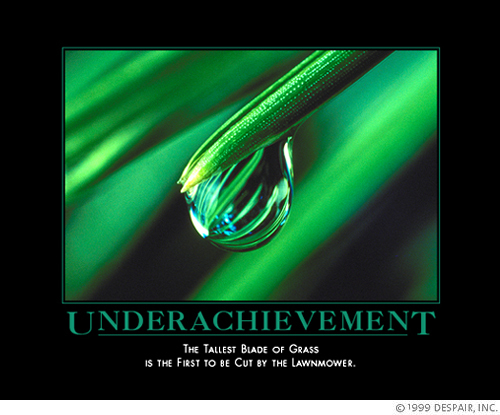 Parting ways with underachievers sends a clear message to your employees. “Be the best at what you do or we’ll find somebody who will.” Getting rid of slackers makes room for superstars and leaders should always be on the lookout for the next superstar. Bringing competitive people into your business will increase competition among your current employees and, ultimately increase sales. Schedule 20 solid appointments per month. Criteria such as these are critical to the success of your dealership and should be modified as needed based on your goals. Consider starting with some simple goals and as the bar is raised, raise expectations. The pay plan of your managers should reflect these goals. For those who do not meet the criteria and collect their 5%, give the money to the top three performers in your dealership as an added bonus. Start rewarding those who are driving the majority of sales. Salespeople are coin operated, so manage your pay plans accordingly. Many of you had a profitable 2010 and perhaps that was due to the processes you have in place, or the hard work of your employees. However, some of you may have prospered simply because you were open for business and our industry saw more buyers this past year. What if we experience another dismal year like 2008? Now ask yourself this question,”How satisfied am I with the way my operation is currently running? What can I do differently that would allow me to sell more vehicles? How can I provide my customers with a better shopping experience?” Make a list of your areas for improvement, build a process, and get to work! With that said, what are some of the process you have in place now that have been successful for your dealership? What process would you like to develop for your dealership in 2011? So that people don't get the wrong message, I would like to add a comment. I never like to see a person get terminated from a job, but often it's necessary for the good of the business. I believe that every employee deserves the right to be trained properly trained. If you're not achieving the job you were hired for, then it's either because you don't know how, or you don't want to. If it's "don't want to" then it's time to move on. Jerry, you are so right! After 30 years in the car biz, it never ceases to amaze me how mediocrity rules. I have a client right now who is getting 20 leads per month off of a $500 PPC campaign. (We do their Social Media etc but they wanted PPC too). Their staff needs so much help but I'm not in a position to really talk about it too much. Thanks for the great post! One more thing: Love, love, love the despair.com graphic. Everyone of the those are hilarious! Jerry I can tell you our inbound phone process is on point for sure! Always room for improvement though. Now we just gotta work on outbound…. There are lots of answers to this questions if you want to break it down, but I think there’s one word that sums most of it up. …. I could go on. Don’t get me wrong – we can all be lazy at times. Heck, I should be working our more but I get too lazy. There’s nothing more irritating than a dealer spending thousands on advertising and $0 for ongoing training. I would say that’s 99% of dealers. But then again when they do pay for training their too lazy to incorporate it in a process and hold their people accountable to getting better. Failure to execute should result in the execution of ones employment … after so many fair opportunities – heck yes! “Salespeople are coin operated, so manage your pay plans accordingly” – I typically agree with this, however I like to watch this speech from time to time to convince myself it’s not true. I hold a marketing meeting every Monday with my GM’s and Sales managers; a time to review where we are with our marketing, budgets and so forth. Of course many times the meetings have a way of turning into how their marketing is NOT working and traffic is low. Then I pull up the reports to show that they’ve had more opportunities to sell more cars this month than the last and the same month last year and the year before. Then we drill deeper into the reports a little deeper and find that it’s not about getting more opportunities to sell more cars BUT maximizing on the opportunities that are already there. Then I drill into the follow-up percentage (that is tracked by an outsourced company so it’s decently accurate) to show we are not following up with all the opportunities that our marketing drives to the showroom, phone and lead box. Then comes the silence and stare down. That’s always fun. Have your own process for getting the right reports in front of you. Take ownership of your reports, commit to reviewing these reports daily. Learn how to read your reports so they tell you a story and pin point areas of improvement. If you’re a GM – train the phone receptionist to print the reports and place them on your desk every morning. Here’s a simple one to start with…find a report in your CRM that tracks phone –ups entered into the CRM. I bet the numbers are LOW!! Phone-ups rarely make their way into the CRM(first red flag), WHY? Because your team needs phone training. If your sales team isn’t effective enough on the phone to get the customers information (enough information) they’ll never enter it into the CRM. How can they? There’s nothing to enter. However, when your sales people have the skills to get all the information, I can guarantee the chances of that customer getting entered into the CRM greatly increases. They WANT their name on that customer! Start with a Step1 Step2 Step3 process and then build upon. Get ball rolling! Great comment Jeff! Spot on! Your growth will come from the opportunities you're currently mismanaging! So True! increasing sales is always a difficult goal to achieve at any dealership. Most try one or two novel ideas and expend a limited amount of money and time hoping that these ideas actually result in increased sales. My view is that increased sales and proper sales management is a lot of work and the amount of effort put forth is directly evident by the number of cars being sold. Sales are the result of many forces and identifying which forces can be controlled at the dealer level is important. Not being fully commited to a continuous and multi faceted plan will result in a disproportionate amount of dollars spent versus increased sales. The use of radio and print are usually the first places most people go when looking to increase sales and these are not only the most expensive but sometimes the least effective. Societal awareness and perception and the sales enviroment and process play large in the publics decision making process. The tools available to the public are changing the way they recieve their information regarding the purchase of most consumer items and that is the biggest change we are seeing is the purchase of a car is now more aligned with a consumer item that a piece of real estate. The plan also needs to be sustainable and continuous and a willingness to change is a difficult part of any plan because it was the current thinking that brought the idea of increasing sales to mind.